Nationally determined contributions (NDCs) are at the heart of the Paris Agreement and the achievement of the long-term mitigation and adaptation goals therein. NDCs embody efforts by each country to reduce national emissions and adapt to the impacts of climate change. Article 7.9 of the Paris Agreement states that all Parties shall, as appropriate, engage in the formulation and implementation of national adaptation planning processes. The Paris Agreement also states that Parties should periodically submit an adaptation communication to the UN Framework Convention on Climate Change (UNFCCC), as part of, or alongside, other communications or documents, such as a NAP, NDC and/or national communication. The majority of developing countries have included an adaptation component in their (I)NDCs. Scaling up adaptation under the Paris Agreement is also a key priority. These countries are now focussing on how NDC goals can be operationalised. As both the NAPS and NDCs are still at the early stages of implementation, there are significant opportunities to maximise linkages and synergies to accelerate enhanced adaptation action. Early learnings from the NAP process can inform NDC components, as well as implementation plans. 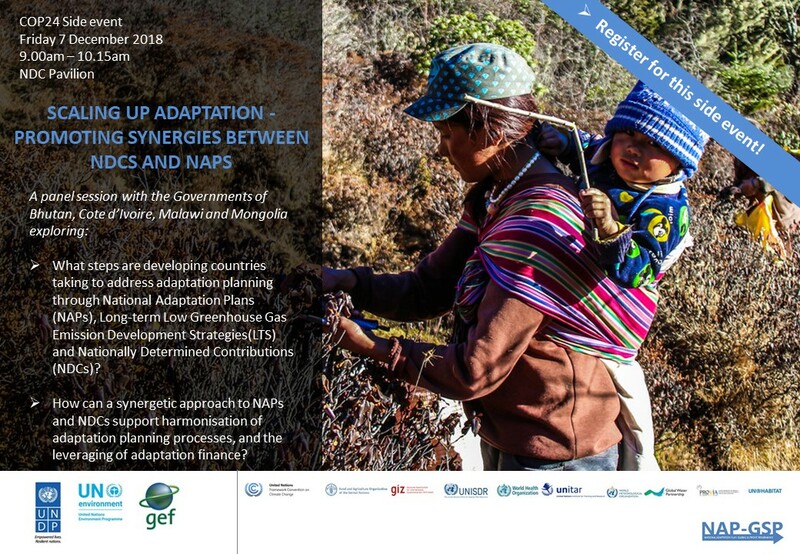 Since NAPs are geared towards building the evidence base and knowledge which is essential to scale up adaptation, building linkages between these instruments will be key. Moreover, establishing coherent governance structures at the national level by harmonising NAP processes and NDCs can help to avoid duplication of efforts and make efficient use of limited resources within developing countries. Aligning the two processes can also rationalise institutional alignments, provide integrated multi-sectoral approaches, support detailed investment planning, aid prioritisation of adaptation options, and assist the process of mobilising adaptation financing. Adaptation-mitigation co-benefits could also be secured through systematic linking of NDCs and NAPs. This COP24 Side Event will learn from experiences from Bhutan, Cote d'Ivoire, Malawi and Mongolia, and aims build to understanding about more the current state of play in aligning NDCs and NAPs. We will consider key opportunities, gaps and challenges. Ms. Tenzin Wangmo is the Chief of Climate Change Division, NEC, Bhutan. She was previously Chief Environment Officer, Water Resource Coordination Division. She has also served as the UNFCCC National Focal Point. The mandate of the NEC is to develop, review and revise environmental policies, plans and programmes, and to mainstream environment into the country’s developmental policies, plans and programmes. Mr Santoni Oreste Akossi serves as the Assistant Director in the Ministry of Environment and Sustainable Development, Cote d’Ivoire. He has also served as the Assistant Focal Point, UNFCCC (CCNUCC). Mrs Tawonga Mbale-Luka serves as the Director of Environmental Affairs under the Ministry of Natural Resources, Energy and Environment. The Department is responsible for all matters related to the environment. She is also the National Designated Authority for the Green Climate Fund (GCF). Dr. Batjargal Zamba is the Mongolian Government's Special Envoy for Climate Change (former Minister of Environment). He is the National Designated Authority (NDA) / Focal Point for the Green Climate Fund (GCF). He has also served as an adviser at Mongolia’s Environment Ministry, and as National Consultant on INDCs, within the Ministry of Environment and Tourism (MET). Anika Terton is the Project Manager, Resilience Program, with IISD, based in Canada. IISD is the host organisation of the NAP Global Network, which aims to enhance national adaptation planning and action in developing countries through coordination of bilateral support and in-country actors. The Network also facilitates international peer learning and exchange.